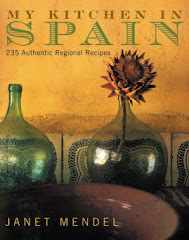 MY KITCHEN IN SPAIN: FRY SOME MORE! 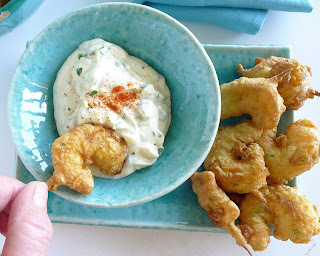 Last week when I posted about Málaga mixed fish fry, I touted olive oil as the best medium for frying foods. Yep, forget the old wives’ tale about “low smoking point.” The truth is olive oil is remarkably stable at frying temperatures. I also made the point that olive oil, unlike other vegetable oils, can be strained and safely reused. The result is that I’ve got about six cups of once-used, slightly fish-flavored, olive oil to use up. Extra virgin olive when heated does lose some of the organoleptic qualities, such as fruitiness, for which it is so valued. For that reason, don’t use your most delicate and expensive oils for frying. They are best saved for using raw. 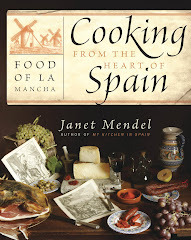 Best for frying is a very stable Picual variety olive oil from Andalusia. I’m using some of my leftover oil for pan-frying. And, not just for fish—potatoes, eggs, breaded chicken cutlets are all fine. But this is definitely a good excuse to fry some more! How about some gambas rebozadas, batter-fried shrimp? 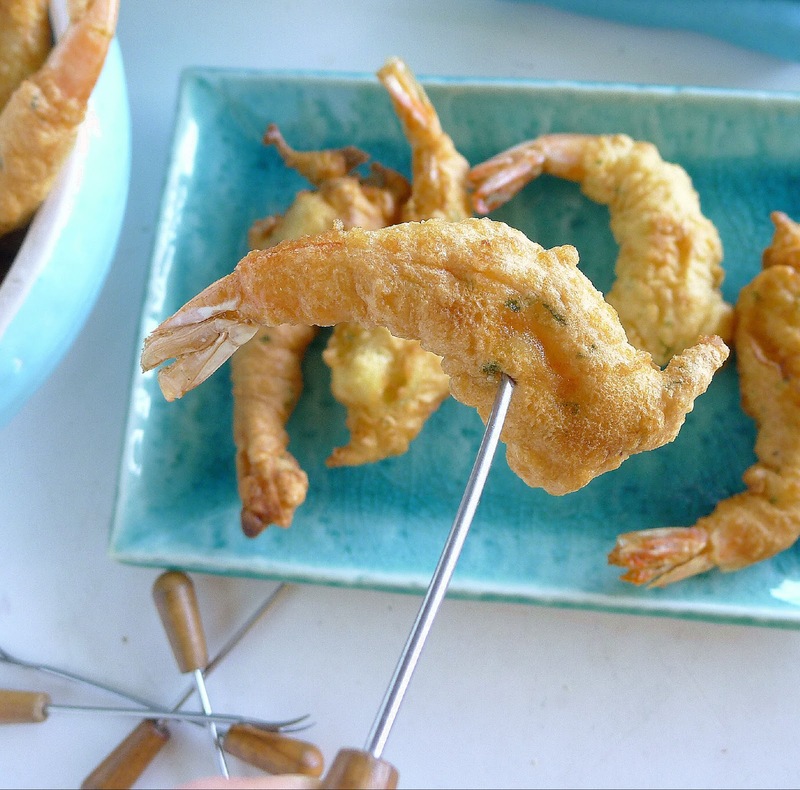 Batter-fried shrimp are crunchy on the outside, moist on the inside. 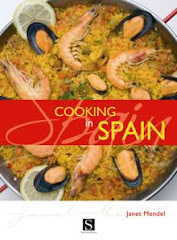 Gambas rebozadas is a tapa I learned to make in local (Andalusian) tapa bars. The batter usually includes chopped parsley, saffron or yellow coloring and, often, minced garlic too. Cleverly, the shrimp are speared on toothpicks and dunked into the batter, picks and all. The Madrid version, called gambas en gabardinas, or shrimp in “raincoats,” is a little different. 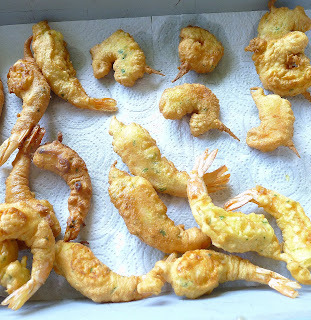 Instead of toothpicks, the tails are left on the peeled shrimp and no garlic or yellow coloring is added to the batter. The simple egg-flour batter has a little baking powder or baking soda to make it puffier. The batter can be prepared in advance, but, if possible, dip and fry the shrimp immediately before serving. 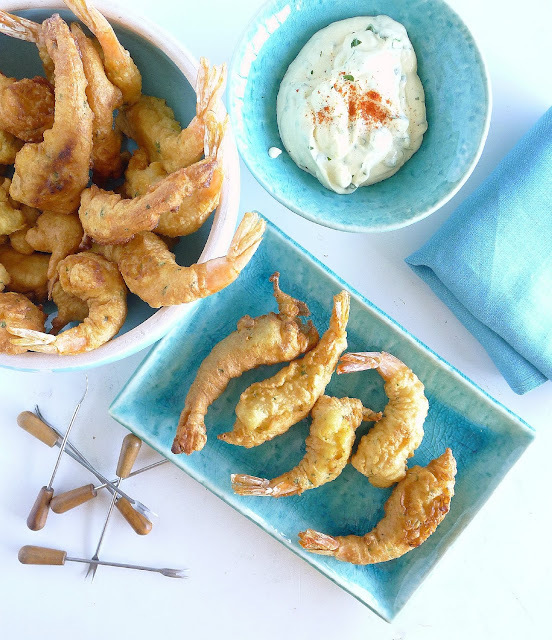 The shrimp are best served right after frying, as the coating loses its crispness as it cools. If necessary, reheat them in a skillet lightly coated with oil or in a medium oven. While Málaga mixed fish fry is served with only lemon, the batter-fried shrimp are often served with a dipping sauce. 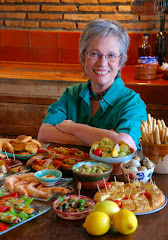 Alioli, garlic mayonnaise, and salsa rosa, “pink” cocktail sauce, are the most usual, but plenty other sauces will complement the shrimp (see below for some suggestions). Batter-fried shrimp are a favorite Spanish tapa. Many dipping sauces for the shrimp. This is alioli, garlic mayonnaise with finely chopped parsley. 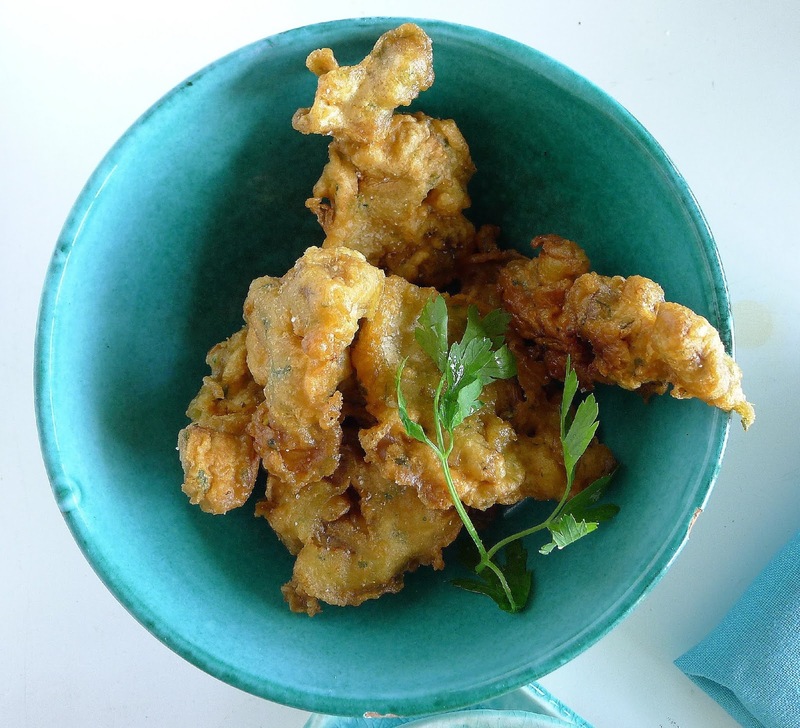 The same batter can be used for vegetables such as cooked cauliflower, mushrooms, artichoke hearts. 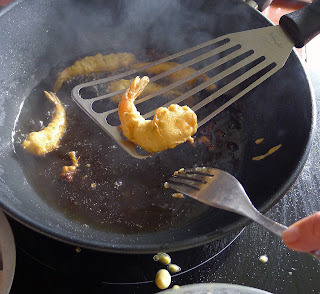 It is usual to devein shrimp before battering. 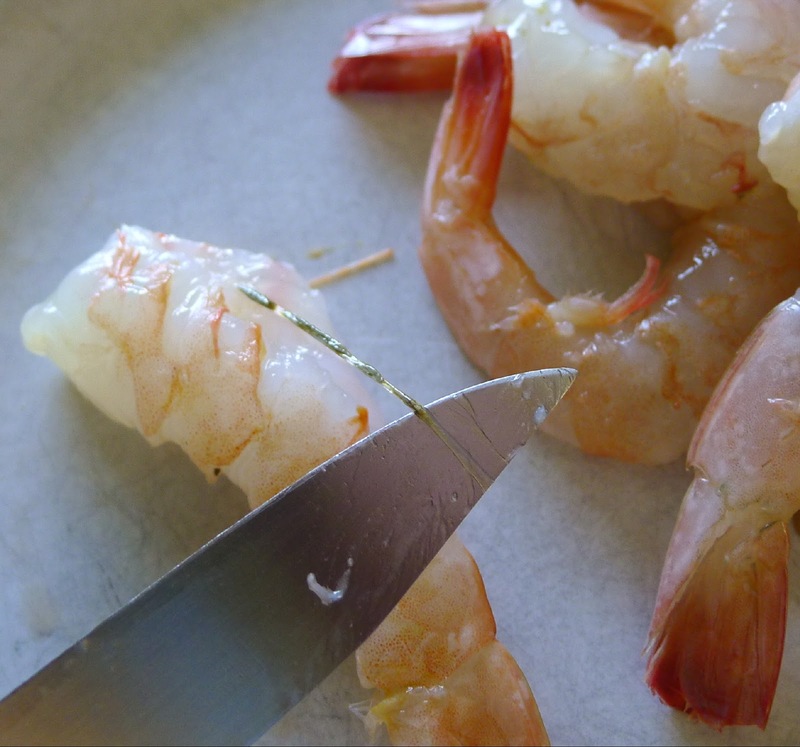 The vein, a black thread that runs the length of the shrimp, is edible, but not pretty. 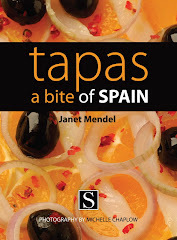 Serves 6 as a tapa. Shrimp on the left have been peeled and stuck on toothpicks. The ones on the right have tails intact. Either picks or tails are useful for picking up the shrimp. Remove vein with knife tip. Peel and devein the shrimp, leaving tails intact, if desired. Or, peel the tails and spear the shrimp on toothpicks. Beat the egg in a bowl. Stir in the vinegar, parsley, saffron, garlic, if using, salt and baking powder. Stir in the flour. Add the water and mix to make a smooth batter. 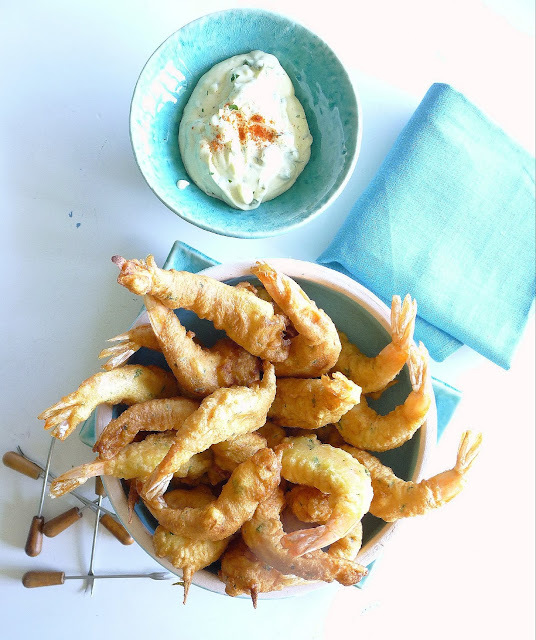 The batter should be the consistency of heavy cream so that it coats the shrimp. Add additional water if necessary. Let the batter stand 1 hour. Place oil to a depth of 1 inch in a skillet and heat to 360ºF. At that temperature, a cube of bread should brown in 25 seconds. Using tails or picks to pick up the shrimp. Dip them in batter and fry until golden on one side. Use tongs to carefully turn the shrimp to brown on reverse side. They need only 2-4 minutes. Fry shrimp until golden, turning them once. 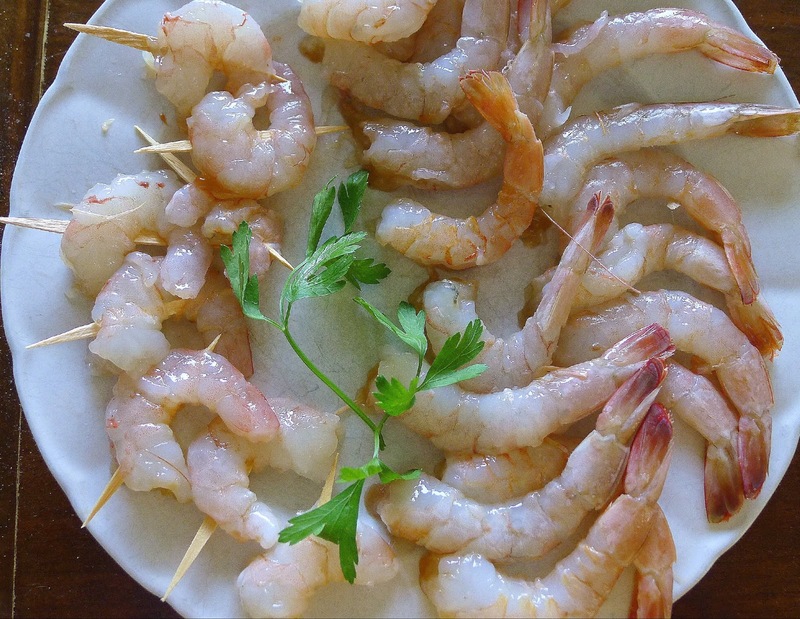 Drain shrimp on paper towels to absorb excess oil. 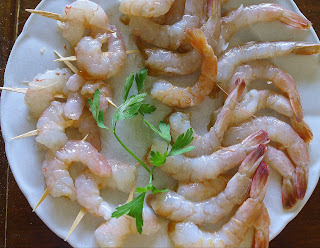 Skim out the shrimp and place on paper towels to drain briefly. Serve hot accompanied by dipping sauce. Use the same batter to coat vegetables. These are quartered (raw) mushrooms dropped into the batter and added to the hot oil by spoonfuls. Pink Cocktail Sauce (Salsa Rosa). Green Chile Sauce (Mojo Verde). 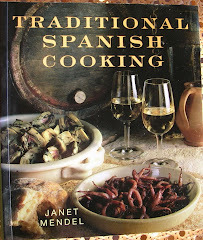 Have you ever done Pinchitos Morunos Janet?